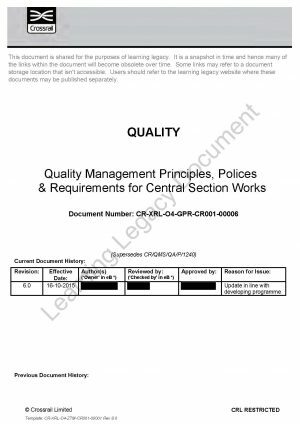 The purpose of this document is to formally set out and communicate the quality management principles, policies and requirements to be deployed by CRL in managing the Central Section Works (CSW) project. This document is applicable to procurement, manufacturing, design and construction field based activities of the Central Section Project included within the Crossrail Programme managed by the Crossrail Delivery Team. It also covers Systemwide installation activities. Effective deployment of this document shall enable the project to continually demonstrate to stakeholder organisations that CRL is delivering the Central Section Works to agreed requirements.